Sabbaghi‎-Nadooshan, R., Siasar Karbasaki, M. (2017). Diagnosis GLY120 Antigen for the Blood ‎and Breast Cancers Using Graphene ‎Nanosheet. International Journal of Nanoscience and Nanotechnology, 13(4), 327-333. R. Sabbaghi‎-Nadooshan; M. Siasar Karbasaki. "Diagnosis GLY120 Antigen for the Blood ‎and Breast Cancers Using Graphene ‎Nanosheet". International Journal of Nanoscience and Nanotechnology, 13, 4, 2017, 327-333. Sabbaghi‎-Nadooshan, R., Siasar Karbasaki, M. (2017). 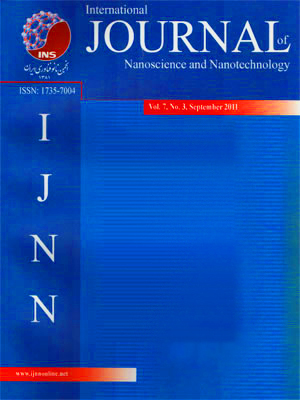 'Diagnosis GLY120 Antigen for the Blood ‎and Breast Cancers Using Graphene ‎Nanosheet', International Journal of Nanoscience and Nanotechnology, 13(4), pp. 327-333. Sabbaghi‎-Nadooshan, R., Siasar Karbasaki, M. Diagnosis GLY120 Antigen for the Blood ‎and Breast Cancers Using Graphene ‎Nanosheet. International Journal of Nanoscience and Nanotechnology, 2017; 13(4): 327-333. The current study designed and simulated graphene nanosensors for detection of GLY120 tumor-associated carbohydrate antigens. Graphene is a two-dimensional nanosheet that offers a high surface-to-volume ratio and high mobility which increases its sensitivity as a graphene sensor over that of other nanoparticles. The current study simulated graphene sensors with and without GLY120 tumor markers and compared the two conditions. GLY120 tumor-associated antigens are present in blood and breast tissue. When GLY120 was attached to the graphene sheet, the Fermi energy, total energy, potential energy, band structure energy and electron kinetic energy of the nanosheet changed. It was then possible to determine the difference in the curves in each state.